Taste test: These are good wide-rippled chips with a distinctive texture and flavor. They've got a soft crunch, and when you bite in, it seems to moisten your mouth (rather than dry it out as most salty snacks tend to). The secret of the texture is probably the soybean oil they're cooked in  it's similar to some other chips made with soybean oil, such as some Grandma Shearer's varieties, except that in this case they're also rippled. 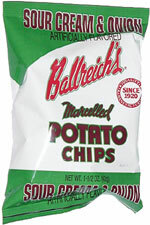 They have a nice, mild sweet onion flavor, with perhaps a little bit of sour cream too. The flavoring appears to be baked right into the chip, as there's no visible seasoning powder except for a small number of green specks (probably parsley, which is usually used just for its color). Smell test: Very mild onion aroma, similar to French's French Fried Onions.